We all know that national colors exists, often associated directly with the flag of a nation. Red and white for example are one of the most frequently used colors world wide by many nations (Austria, Poland, Japan, Indonesia, ...), also blue (US, France, UK, Russia). Black on the other side today is only used by one of the major nations: Germany. It was also used in the past by its predecessor states, the Third Reich, the German Empire, and also many of the different German states before unification like Prussia. Austria also used Black in combination with Yellow for most of its history and only abandoned that after World War One around 1920. Which leads us to my question - why are the central Europe nations the only major nations to use the color black as their national colors in the past and today? Does it symbolize something special? Wikipedia (in German) has a long and fascinating article on the history of the German national colours. Without getting in all the details, it seems that the link with the colours of the Holy Roman Empire symbols isn't historically established and might have been a later rationalisation for the choice. Still according to this article, the first use of these colours in association with the idea of a German nation dates back to the wars against Napoleon and specifically to the Lützow Free Corps. The flag seems to have been derived from the colours of their uniforms, which was in turn mostly a matter of practicality. As volunteers had to buy their equipment themselves, black coats would have been cheaper to obtain at the time. This regiment was strongly associated with the colour black and one of their nickname was in fact “Black rangers” (Schwarze Jäger). The first sources explicitly linking the colours with the imperial banner date from the time of the 1848 revolutions, more than 30 years later, at a time when the flag and the colours were already strongly associated with (progressive) German nationalism. To your broader question, black does not seem particularly unusual in flags (Wikipedia counts 69). Among larger countries, it's used by Egypt and if you discount the many other Arab and African countries using it as not being “major nations”, you only have very few countries left, with Germany (in its various shapes) being the only one using black (so no evidence of any association with Central Europe as such). In such a small sample, the absence of any given colour could therefore easily happen by chance and is not in need of any specific explanation. 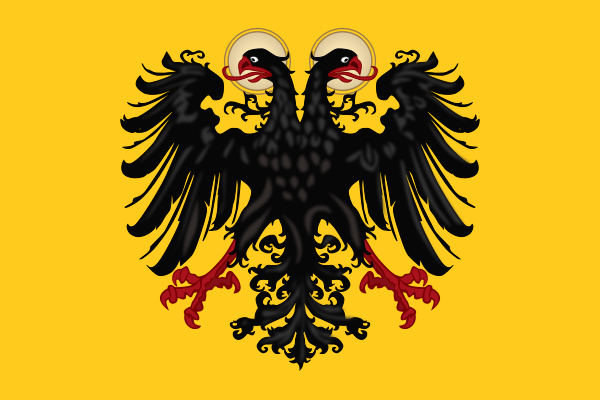 I believe it is ultimately inherited from the colors of the holy roman empire. Not the answer you're looking for? Browse other questions tagged germany austria flags national-symbols or ask your own question. Why do so many national flags contain the color red? Tricolore: Why have the colors been chosen that way? Why did Germany not join the United Nations until 1973? What statuses did Black Africans have in the court and royal family of Emperor Frederick II of Hohenstaufen and do their descendants survive? Did the Confederate States of America ever officially adopt William T. Thompson's descriptions of the CSA national flag?